The essays in this volume discuss the overlap between philosophical, aesthetic, and political concerns in the 1790s either in the work of individuals or in the transfer of cultural materials across national borders, which tended to entail adaptation and transformation. 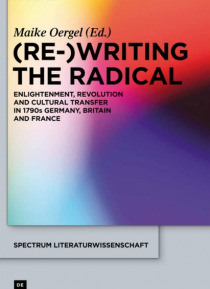 What emerges is a clearer understanding of the "e;fate"e; of the Enlightenment, its radicalization and its "e;ove… rcoming"e; in aesthetic and political terms, and of the way in which political "e;paranoia"e;, generated by the fear of a spreading revolutionary radicalism, facilitated and influenced the cultural transfer of the "e;radical"e;. The collection will be of interest to scholars in French, German, English, and comparative studies working on the later 18th century or early 19th century. It is of particular interest to those working on the impact of the French Revolution, those engaged in reception studies, and those researching the interface between political and cultural activites. It is also of key interest to intellectual historians of this period, as well as general historians with an interest in modern conservatism and radicalism.